This month, we take a deep dive into New York City's retail trade, and we welcome Josh as our Economic Snapshot podcast host. 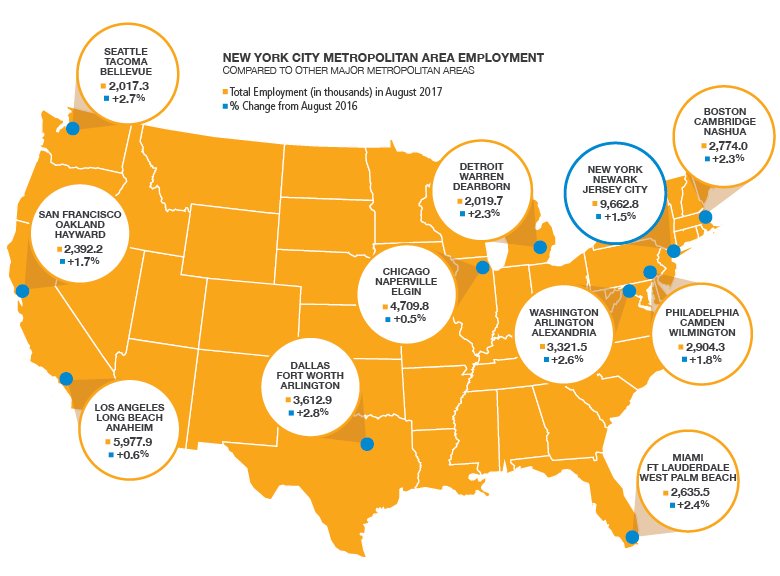 Private sector employment in New York City fell in September 2017. Following last month’s losses of 1,200 jobs, the private sector shed 31,700 jobs this month1. Nearly 60 percent of job losses were focused in Educational Services—a historically volatile sector that had seen unusually large gains (totaling +18,100) in June and July 2017. Other job losses were concentrated in Retail (-3,500; see Industry Snapshot for further analysis) and Trade & Warehousing, which fell by 3,300 jobs. Employment rose modestly in four sectors, led by Construction, which rose by 1,600 jobs and Real Estate, which rose 1,300. Despite the decrease in jobs over the previous month, private sector jobs have grown 1.3% since September 2016, rising by 48,100 jobs. The unemployment rate continues to rise, but is below that of this time last year. In September 2017, unemployment reached 5.1%, up 0.2 percentage points from last month. This time last year, the rate was 5.3%. Labor force participation ticked up 0.1 percentage points to 61.5%; just below June 2017’s record high of 61.7%. Wages provided positive news last month, with hourly earning increasing 0.2% from September 2016, a reverse from August declines. Average hours worked were constant from last year, resulting in average weekly earnings increasing 0.2% from last year to $1,188. 1August 2017 employment estimates were revised up from -3,900 by the New York State Department of Labor. Monthly employment data are seasonally adjusted by OMB. Sources: New York State Department of Labor; US Bureau of Labor Statistics. Retail Trade is one of New York City’s largest sectors, employing 341,500 workers in September 2017, 8.8% of private sector employment. While employment in the retail sector was mostly steady over 2015 and 2016, the sector has faced headwinds in 2017. After falling just 0.3% over 2016, retail employment has dropped 2.7% since January 2017. Analysis of longer-term trends within the retail subsectors provide insights on a changing sector. Of the four major subsectors, which comprise a collective 70% of retail jobs, only clothing stores saw job losses between 2012 and 2016. These losses were concentrated in 2015 and 2016, during which employment fell by 3,000 to 74,200; clothing stores were the only subsector to lose jobs through both years. The other three major subsectors—food and beverage, health and personal wellbeing, and general merchandise stores—experienced above-average growth between 2012 and 2016. However, the largest of these—food and beverage stores—fell 2.3% to 81,300 jobs in 2016. This was the subsector’s first job loss over the last ten years. Non-store retailers, which includes ecommerce, were the fastest-growing sector over the last five years, growing 24.5% to 14,000 jobs. 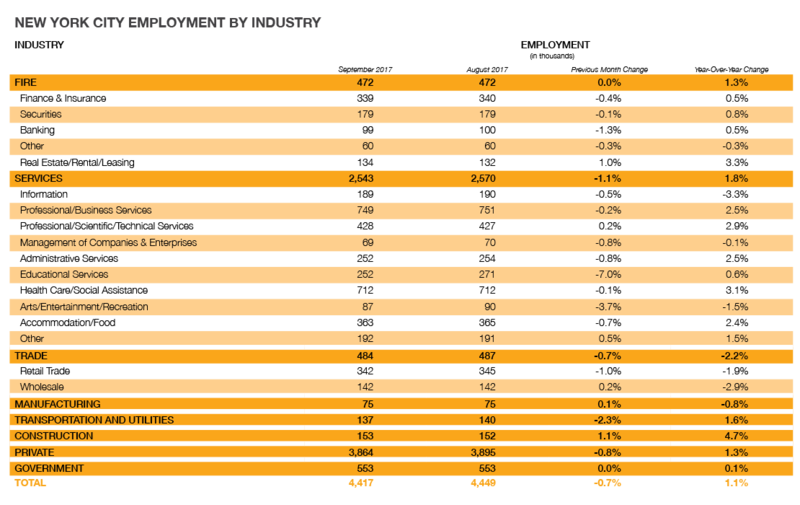 These firms added the most jobs between 2011 and 2013, when the subsector averaged 15.4% annual growth. However, non-store retail employment was relatively flat in 2016, calling into question whether the subsector can sustain long-term growth to compensate for losses elsewhere in the retail sector. Through Gallup Analytics, through which Gallup interviews 1,000 U.S. adults each day, 350 days per year, Gallup is able to track the daily average dollar amount New Yorkers report spending on consumer goods. Through this economic data collection platform, Gallup asks how much money residents say they have spent on consumer goods (everything excluding a home, vehicle, or normal household bills) the day before. The metric gives an indication of discretionary spending on nonessential goods by New Yorkers across all 5 boroughs. Results for this metric are based on telephone interviews conducted nightly throughout 2016, with a random minimum sample of 590 individuals per month, aged 18 and older, living in New York City. The margin of error is ±$6. Gallup delivers analytics and advice to help leaders and organizations solve their most pressing problems. Combining more than 80 years of experience with its global reach, Gallup knows more about the attitudes and behaviors of employees, customers, students and citizens than any other organization in the world. We thank Gallup for providing NYCEDC access to this invaluable behavioral economic data on NYC residents. Last year, spending for New Yorkers peaked at April and May and again in October, reaching up to $130.81. 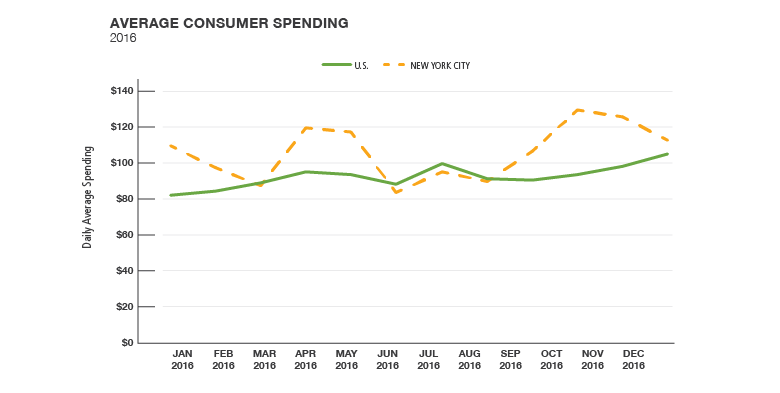 While national consumer spending annual high of $105.28 in December is in line with expected spending highs during holiday, New York’s fell by 11% during the same month. Economic literature suggests consumer spending may be related to income1 or unemployment2. Indeed, average hourly wages peaked at $34.70/hr in October 20163 and the unemployment rate fell through the fall and winter after a summer peak at 5.4%.4 Further, New Yorkers remained upbeat on other of GALLUP’s economic measures for December 2016, including their confidence in the US economy. Other explanations include traveling patterns. Subway ridership tends to drop in July and August and declines from October through December.4 In turn, December has low high-income earners in the sample of respondents, compared to other consumer spending peak months. Sources: 1Jappelli, Tullio & Luigi Pistaferri. The Consumption Response to Income Changes. Annual Review of Economics. 2010. Ganong, Peter & Pascal Noel. How Does Unemployment Affect Consumer Spending? Yale Economics Department. 3NYSDOF 4NYSDOF 5MTA Ridership data. Average residential rents rose modestly from last year in September 2017. This is the second month in a row that has seen year-over-year increases, and follows three consecutive quarters of stagnant or falling average rents. Recent increases remain below the average rate of increase in prior years. Home values, meanwhile, rose 14.3% from September 2016. This rate of increase has been constant over the last four months. The number of residential units starting construction in September 2017 increased from the twelve-month average ending in August 2017. This increase was led by the Bronx and Brooklyn, where construction began on 528 and 971 residential units, respectively. This is the third consecutive month in which the rate of housing starts rose from prior-year averages. Brooklyn is the only borough with an above-average rate over these three months. The New York City office market exhibited mixed signals in the third quarter of 2017. In Manhattan, net absorption— the change in occupied space over the quarter—remained negative, falling by 845,000 square feet, with vacancy rising 0.3 percentage points to 8.2%. Average rents however rose 0.9% from the same time last year, to $65.70 per square foot. Increasing vacancies in Class B buildings across the borough drove these trends. 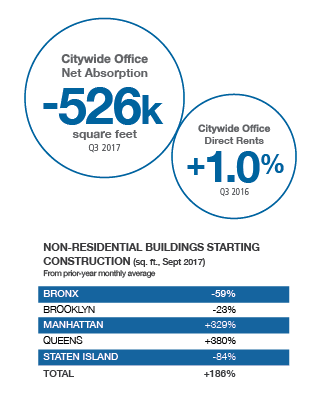 Conversely, office markets in boroughs outside of Manhattan saw positive net absorption (318,200 square feet), amid falling average rents (down 0.8% to $33.97). While vacancies rose (up 0.4 percentage points to 7.1%), the delivery of seven buildings boosted net absorption. Construction starts in non-residential buildings in September 2017 saw a major increase from prior year monthly averages. 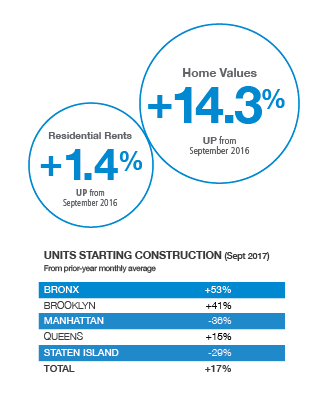 This increase was driven by construction spikes in Queens and Manhattan, both of which saw upticks in the number and value of office and mixed-use developments. The New York City tourism sector appeared to continue its expansion in August 2017. Attendance at Broadway shows rose 15.4% from last year, reaching 1.0 million. While hotel room rates fell in July 2017 compared with the prior year, this was the result of the growing room inventory, which expanded 5.3% over the last year. Rising ticket prices pushed revenues up 25.8%. Trips into the City across airports, bridges and tunnels, and commuter rails all rose for the second consecutive month. New York City subways and buses, however, continued their downward trends, falling 2.7% to 190.4 million rides. This is the seventh month in a row in which subway and bus ridership in the City has fallen from the prior year. *Note: Airport and Broadway data are reported for August 2017. Hotel data is reported for July 2017.